This is the last post of our 4 part series documenting Oak Park’s thriving community spirit. Oak Park is Sacramento’s first suburb. If you attended this block party, please leave a comment below. Wow, we had a good time! Sixty-one people signed in for our potluck, but many more cruised through to check us out. This year we really focused on the kids. 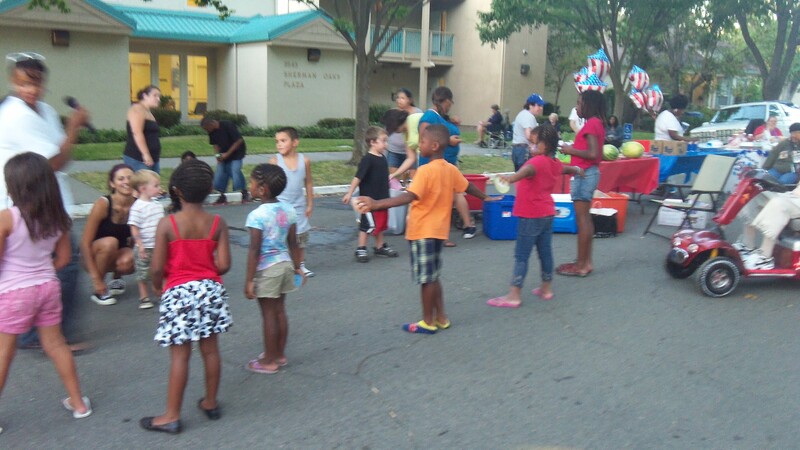 There was face painting, sidewalk chalk, a bounce house, a watermelon eating contest, a bubble station, and a few rounds of freeze dance. We had a DJ with a wireless microphone and that really helped keep things moving. We were fortunate to have visits from Police Sgt. Susan Feenstra, Mayor Kevin Johnson and Councilmember Jay Schenirer. Sacramento Housing and Redevelopment Agency/Sherman Oaks provided hot dogs, buns, and tables , and we received five (5) $40 donations from Food Source , the landlords of 3520 and 3532 Y St, the landlords of 3439 and 3519 1st Av, and a $60 donation from OPNA. Prizes were provided by Dry Clean Today, Brenda’s Main Event’s Beauty Complex, Mary’s Avon, and Cactus Ray’s Cactuses. Thank you to all who helped bring us together. As a result, we are a happier, more friendly, and safer street. Great job bringing the community together Al! Jose Hernandez,was very happy to re-group with this community after attending his senior nutrition program.